Peace and quiet; surrounded by nature and standing next to a giant white and gold stupa (mound containing Buddhist relics) looking over towards a Tibetan Buddhist temple, you don’t hear much of anything except for your own thoughts. When suddenly, a bald, maroon-robed Buddhist monk walks past you and into the building. For a moment, you forget that you are in the middle of Indiana, when really, you are at the Tibetan Mongolian Buddhist Cultural Center just five miles southeast of downtown Bloomington. This rich, abundant Buddhist culture is not something you would expect to find in a small city of just over 80,000 in the heart of the mid-west. Situated on 108 rural acres, the cultural center includes the Kumbum Chamtse Ling Temple, a cultural building, two traditional Tibetan Stupas, four retreat cottages, a teaching pavilion and two private residences. The Tibetan Mongolian Buddhist Cultural Center (TMBCC) was founded in 1979 by IU professor Thubten Jigme Norbu, the brother of the 14th Dalai Lama of Tibet. Norbu founded the cultural center in order to preserve the Tibetan culture and religion. The TMBCC’s mission is to educate the public about the history and culture of Tibet and support Tibetans in exile. At the entrance is a flagpole with both the American and Tibetan flags to symbolize the welcoming of Tibetan refugees. The TMBCC has been visited by His Holiness the Dalai Lama five separate times, the most recent being in 2007. Visit the Cultural Building where you will find Tibetan works of art such as paintings of Buddhas, Bodhisattvas, and Tibetan historical figures, not to mention Tibetan Butter Sculptures. After visiting the Library of Tibetan works and the gift shop, also located in the Cultural Building, be sure to follow the path which will lead you to two Tibetan Stupas, traditional Buddhist reliquary structures that symbolize enlightenment. At the end of the path, you will find the Kumbum Chamtse Ling Temple. 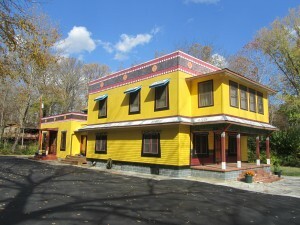 According to the website, the temple’s mission is to foster an interfaith dialogue and is open to people of any faith who would like to come to the temple “to meditate, participate in retreat programs, and attend Buddhist Darma teachings.” Every Sunday at 10:30am, you are able to attend a teaching and join them in a Sangha vegetarian meal. In addition to religious programs, the TMBCC also offers guided tours daily (free unless in a group of 10 or more then it is $35) and hold yoga classes on Tuesdays and Saturdays. The TMBCC also has a summer camp for the children of Tibetan and Mongolian refugees to help teach the children about their native culture. The TMBCC grounds are open to the public during daylight hours year round. Don’t stop your Tibetan experience at the TMBCC; visit the Dagom Gaden Tensung Ling Buddhist Monastery next! The monastery is only 15 minutes outside of Bloomington in a corner of Bloomington’s Lower Cascades Park. The natural setting offers a sense of quiet and peace from the bustling college town, and the building and grounds are decorated by hand with traditional Tibetan colors and designs. The DGTL Monastery was founded in 1996 by prominent Tibetan Buddhist teachers Venerable Kyabje Dagom Rinpoche and Venerable Gonsar Tulku Rinpoche. Ven. Gonsar Rinpoche was recognized by His Holiness the Dalai Lama as the fifth incarnation of the Gonsar lineage when he was 3 years old. Born in Shigatse, Tibet, he was forced to flee from the Chinese in 1959. From there he traveled from India to Switzerland studying and teaching. In 1996, he came to Bloomington to teach a class at IU on Lam Rim (Stages of the Path) and became the co-founder of the DGTL Monastery. Ven. Kyabje Dagom Rinpoche was recognized as the 12th incarnation of the Dagom Rinpoche lineage. Dedicating his life to the teaching and giving of sutra and tantra transmissions, he has received Geshe Lharampa, the highest degree in the Tibetan monastic system. In 1996, he helped establish the DGTL Monastery in Bloomington. He has also established monasteries in Massachusetts and Minneapolis. The monastery acts a traditional monastery for monks of the Gelugpa lineage; however, it is also open to people from any nationality and background to participate in their many cultural and religious programs. The monastery hosts weekly and monthly programs, which can be educational, cultural or religious. 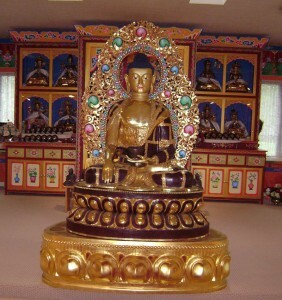 Special events are also held at the monastery such as visiting teachers who give talks and classes, retreats, and a 6-week long introduction to Buddhism class. However, one of the most attended events is the Taste of Tibet. Twice a year, the monks cook a feast of traditional Tibetan food for the enjoyment of the community. The monastery is also open daily to visitors from 9am-6pm for no cost. Still hungry for Tibetan culture? 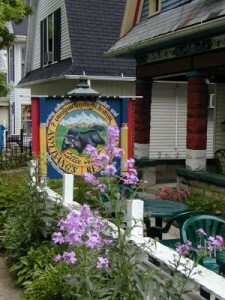 Eat at one of Bloomington’s Tibetan restaurants! Try Anyetsang’s Little Tibet on Fourth Street. It serves authentic Tibetan, Indian, and Thai food. Be sure to try a variety of Mo Mo, a traditional Tibetan dumpling, or if it is cold outside, try one of the Thugpa soups! The Snow Lion on Grant Street is also a Tibetan favorite in Bloomington. It is owned and managed by Jigme Norbu, the nephew of the 14th Dalai Lama of Tibet. One thing is for certain, in Bloomington, the Tibetan culture has found a home within the Midwest.